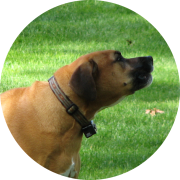 Educational articles about Mastiff dog breeds. Neopolitan Mastiffs are guard dogs. Origins: Neopolitan Mastiffs were initially bred as fighting dogs, but was also used to pull carts and guard stock. Description: Neopolitan Mastiffs are large boned, powerfully built dogs. They have excessive skin similar to a Shar Pei that falls into folds. Neopolitan Mastiffs have a large broad skull, with a square muzzle and tiny triangular ears. Size: Neopolitan Mastiffs weigh 110 to 155 lbs, they stand 24 to 31 inches tall at the shoulder. Coat: Neopolitan Mastiffs have short, silky coats. Neopolitan Mastiffs can come in black, blue, all shades of grey, from fawn through to red, and brindle. Disposition: Neopolitan mastiffs are fearless and highly protective of their family and territory. Neopolitan Mastiffs are sweet natured with children, they can be stubborn but are obedient once trained. Type Dog: Neopolitan Mastiffs are working guard dogs. Litter Size: Neopolitan Mastiffs give birth to litters of 6 to 12 puppies. Behavior: Neopolitan Mastiffs should be socialized early so they do not become overly protective. Neopolitan Mastiffs have a high pain tolerance due to their fighting background. Life Span: Neopolitan Mastiffs live 9 to 15 years.